How to play "Shake Paws"! "Shake Paws" is a visiting game. 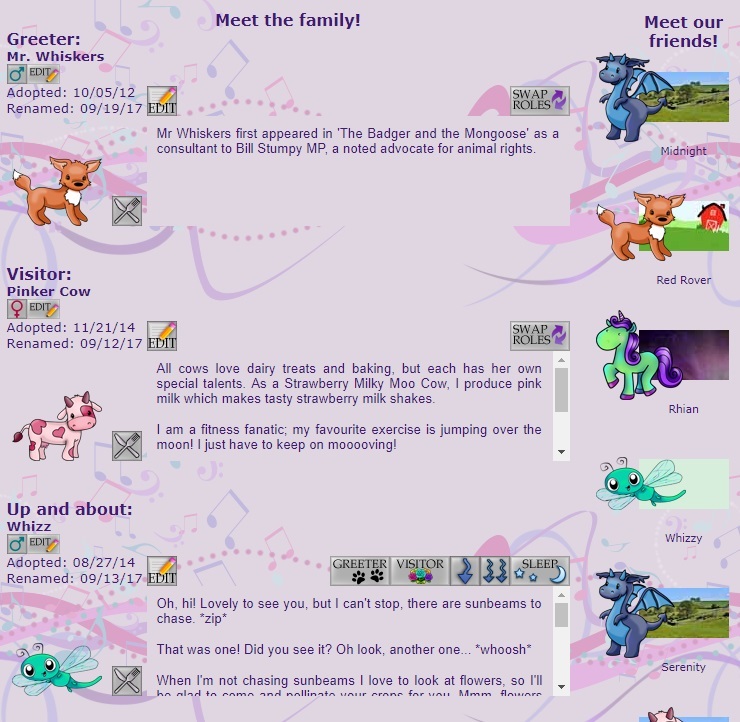 The first thing you need to know is that you cannot get lost visiting, because the "My Pets" button in the menu will always take you back to your own page, and the "Home" icon in the toolbar will also take you there. Everywhere you go, there is at least one of these ways to get home! All with the least clicks possible and no repeat visits! This is what the top of your own page should look like, except of course it will have your name and icon on it instead of David Weston's. There are many ways to visit another user. The first one is to click one of the "Visitor list" icons just below the toolbar. If you are just beginning the game you may see "User" rather than the time since a visit. In that case, the game is suggesting other users to visit before you have had any visitors. So, you always have someone to visit, even if no-one has visited you yet! For this example, I will click on Jolie's icon. On Jolie's Page (or any other user's page) you will see some icons to the right of their main picture. If you are using a desktop or laptop computer, hover the icons to see a message telling you what the icon does. In the mobile version (which handles phones and tablets) you will have to click a tiny "+" sign to see the message. Either way, the "paw" icon enables you to shake paws with the other player's greeter pet. Just click it! When you click the icon, you get to see the interaction. Jolie's pet is a butterfly and mine is a cow. Somehow they have shaken paws without killing the butterfly! They have exchanged visitor cards (these are currently inactive but may feature in a future game) and each of them receives 1 silver mole. Silver moles are a currency used to buy many things in the Department Store and the Food Shop; more about those later. Basically, you make a click and you get free currency! You can only shake paws with the same pet once per day, so now we need to find another pet to shake paws with! Who to visit next? You could click one of Jolie's visitor list, but let's try another way. If you hover (desktop) or click the "+" (mobiles) on the icon showing two penguins, the advice tells you "Meet our friends". Click the button to see a selection! In an ideal world, you would be able to visit all the users you want to meet once per day, without keeping lists. You can! To do so, click the "Visit" link in the menu. It will give you several different ways to do so! 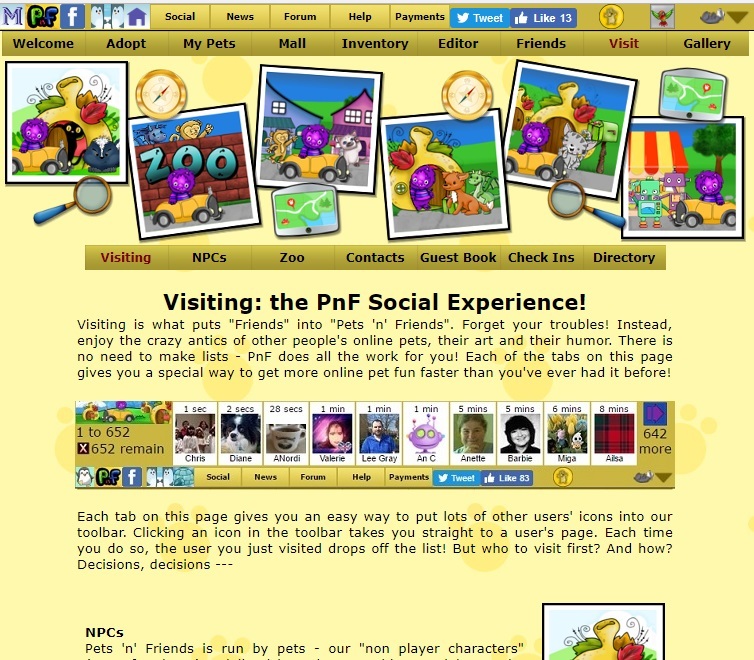 On the "Visit" page, you can choose from six different ways to visit pets quickly and simply. NPCs; what are they? Just click the "NPCs" tab to find out! NPCs are "non-player characters". They do not belong to any user and they play special roles in the game. They also give special rewards for paw shaking! Let's visit some. To do so, just click the purple "up" arrow by the text "Visit the NPCs!" A list of icons now appears in the toolbar! You can only see 10 of them at once, so in this case, when there are 15 icons in total, the toolbar tells you there are also 5 more as yet unseen. To visit a pet, just click one of the icons! 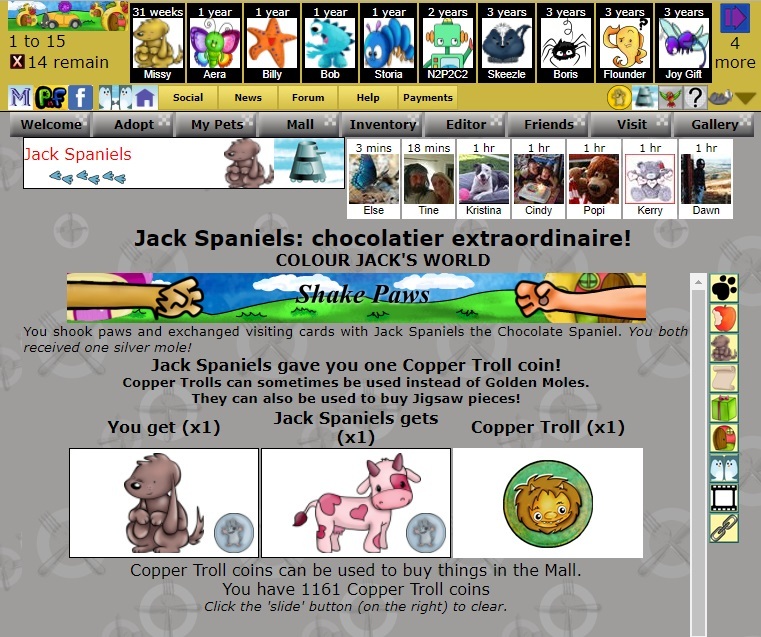 You can click any of them, but I will start with the first: a brown dog called "Jack". Clicking takes you to Jack's page. His full name is "Jack Spaniels". You will now see that 14 icons remain, and Jack's picture has been removed from the list. You are on his page and the game knows it, so it will not suggest that you go back again today. 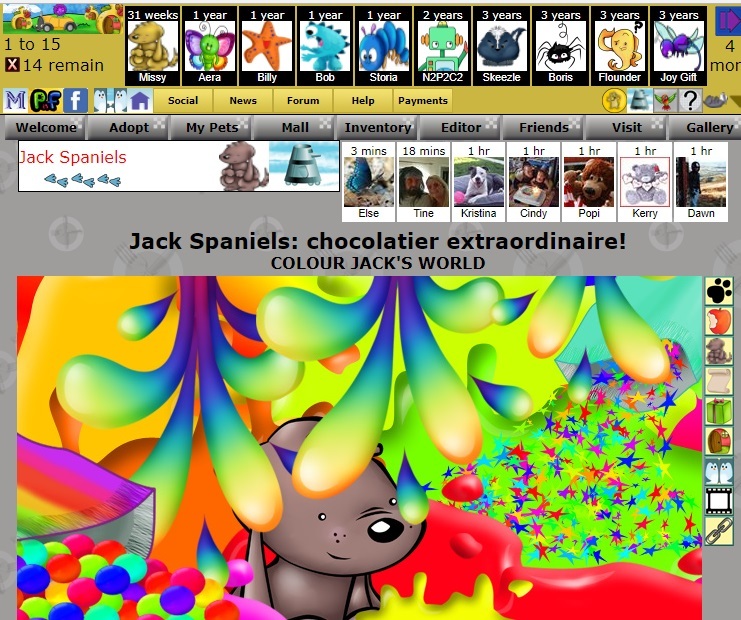 Click the "paw" icon to shake paws with Jack. Each of the NPCs will give you a "Copper Troll". These are valuable; four of them are worth as much as a "Golden Mole", our premium currency. Currently we have 15 NPCs, so by shaking paws with each of them you can earn 15 copper trolls per day! You can often learn things about the game by visiting their pages, too. You do not have to finish any list of icons in the toolbar. You can get rid of them at any time by clicking the little "x" icon to the left of "14 remain". Let's do that. When you click the "x" icon, the toolbar icons disappear. 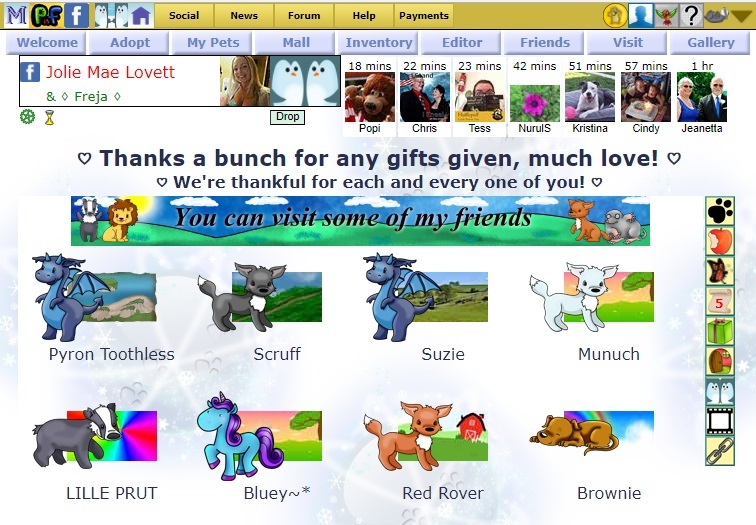 If you do so by accident, just go back to the "Visit" page and load the toolbar icons again; the game remembers which pets you have visited and only shows you the ones you have not shaken paws with today! What now? 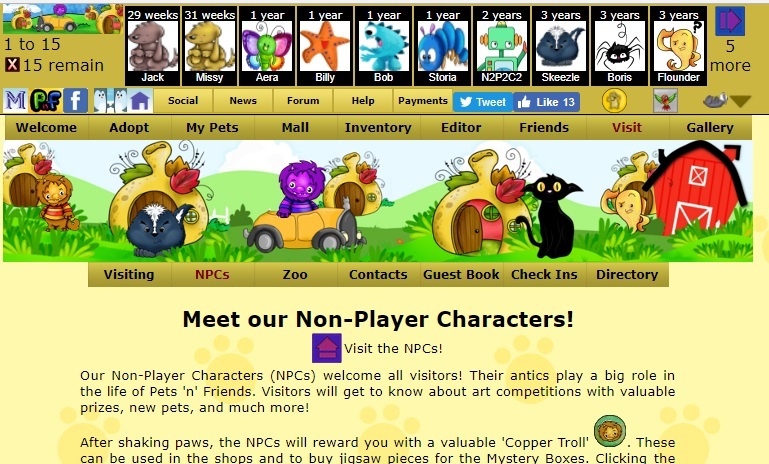 If you want to go back to your own page, just click the "My Pets" button in the menu. But how about we visit some real users first? To do so, click the "Visit" button again. This time, let's click "Zoo". 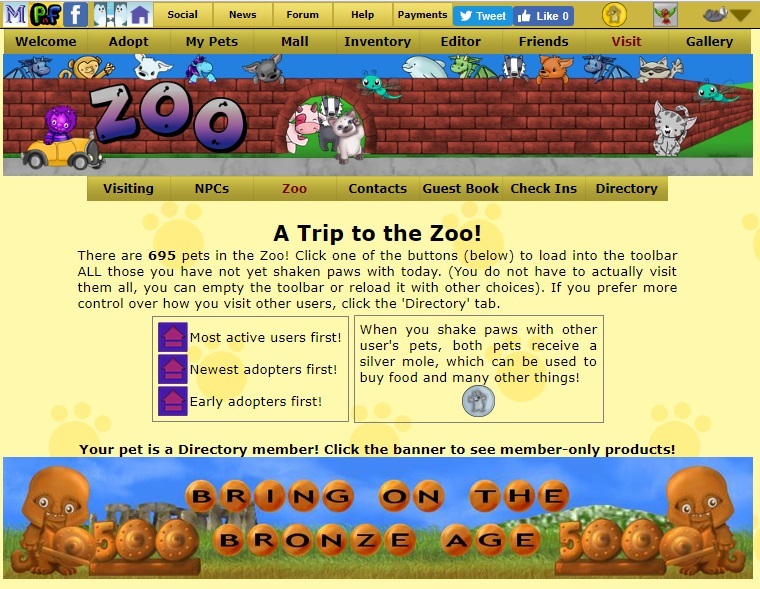 At the time of visiting, there are 695 pets in the Zoo! To visit them all in one go, just click one of the purple "up" arrows! 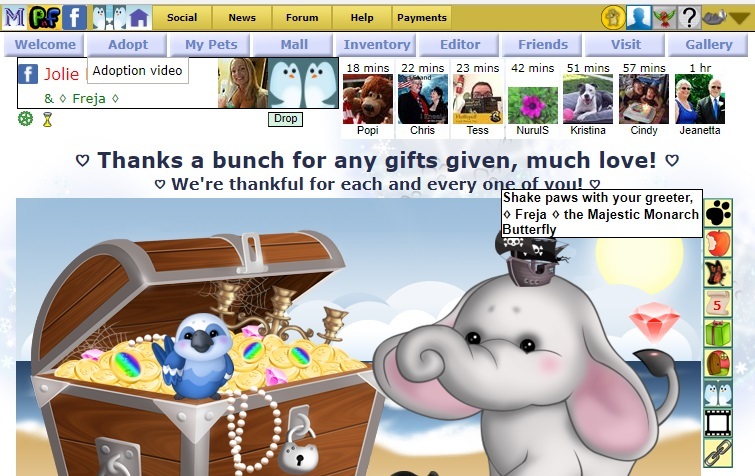 Remember, you do not have to visit all of them, and you can find your way home with the "My Pets" menu button. But wait a minute, what order should we pick? Say you only want to visit 100 pets. Which should they be? Click "Most active users first!" for the best chance that those you visit will visit you back. These are the people who play the game a lot. When they visit and shake your greeter pet's paw, you will get a silver mole for doing nothing! If you want to visit the newest users, to get to know them or see if your friends have joined the game, click "Newest adopters first!". You also have the option to visit the earliest adopters first. In each case, clicking the icon loads the toolbar and everything works the same way it did with the NPCs, except you get silver moles and not copper trolls. Work hard and you are on the way to 695 silver moles in one day, with no repeat visits! The "Visit" tab has other options: "Contacts" (your in-game friends), "Guest Book" (those who you have visited; this retains details for a week), "Check Ins" (those you have already visited) and "Directory", which is an advanced method of getting more control over who you see and how. One more thing. If you have more than one pet, you can choose which of them is your "Greeter" and which is your "Visitor". 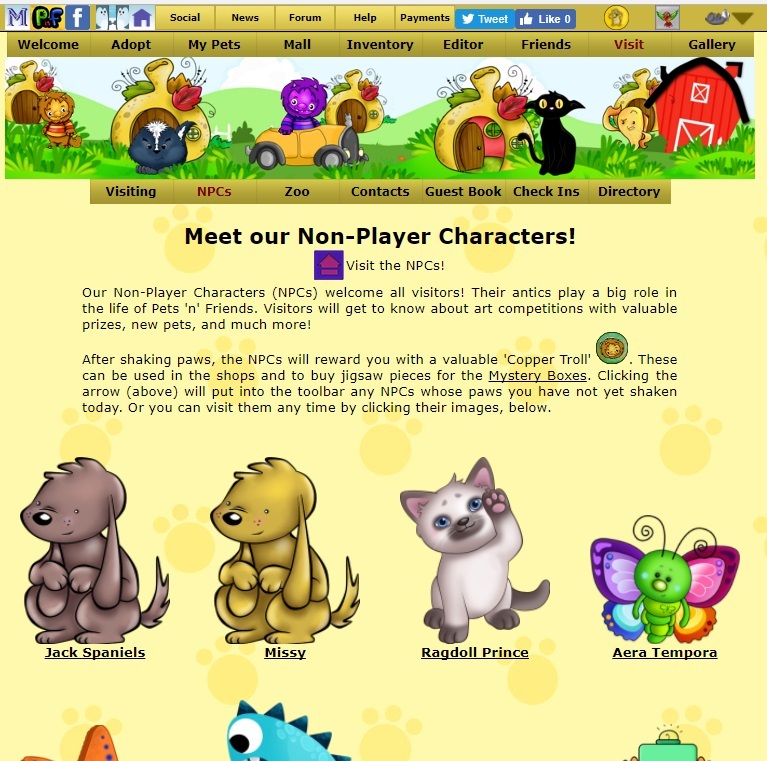 To choose, click the "My Pets" button in the toolbar, then scroll down the page. Here is how it looks with three or more pets, to cover all the options. The "Greeter" pet is always at the top, with the "Visitor" beneath, and any other pets below them. To swap the Greeter and Visitor, click the "Swap Roles" button. To make another pet the Greeter, click the "Greeter" button. To make another pet the Visitor, click the "Visitor" button. The page will refresh and you will see the changes you have made. It's as simple as that!